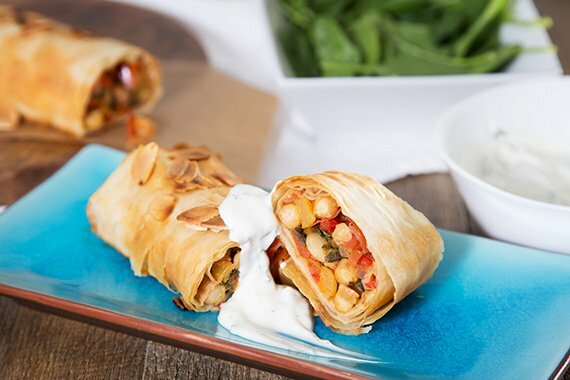 Hints of cinnamon, smoky paprika and coriander combined with plenty of vegetables and crunchy filo pastry - this aromatic, delicious recipe is a good one to have up your sleeve. It requires a little bit more time than our usual recipes but it is well worth it! Share the moment #youplateit with us on Instagram and Facebook - we love seeing you triumph! Preheat oven to 200°C. Wash the fresh produce. Peel ¾ of the red onion(you will have left over), then slice thinly into half rings. Deseed capsicum and cut into thin slices. Finely chop the apricots. Drain and rinse the chickpeas. Pick coriander and mint leaves (discarding stems), roughly chop and keep separate. Medium dice tomato. Heat oil in saucepan (enough to cover base), add onion and cover with a lid (or foil) and sweat over a low heat until soft, about 5 minutes, checking regularly that they don’t begin to brown. Remove lid, add capsicum and continue to cook until the capsicum begins to soften, about 4 minutes, stirring occasionally. Add the harissa and Moroccan strudel spice. Mix well and cook for 1–2 minutes. Add the tomato and apricots to the pan, stir well and simmer gently, uncovered, for 5 minutes, to drive off excess liquid and concentrate the flavour. When the mixture is moist but not runny, add the chickpeas and a large handful of spinach and heat through until the spinach is just wilted. Add the chopped coriander leaves and &frac23; of the flaked almonds. Season with salt and pepper, remove from the heat. Melt the butter in a microwave in 10 second intervals. Carefully unroll the filo pastry on a clean work surface. Cover with some damp sheets of paper towel to stop it drying out. Take a sheet of pastry and carefully brush with some melted butter. Set a second sheet over the first and brush butter over it as well - continue, making 4 layers (in total). Brush the pastry with the melted butter and place the chickpea strudel filling in a line down the short edge of the pastry. Roll the pastry around the filling, in a fairly tight roll. Gently place the strudel onto a lined baking tray, with the pastry join underneath. Brush the pastry with more butter and sprinkle over the remaining almonds, then bake in the middle of the oven for 15 - 20 minutes, or until the pastry is golden brown and the filling is piping hot. Remove from the oven. While the strudel is cooking, combine the yoghurt and mint in a small bowl and mix well. Season with salt and pepper. Carefully cut the chickpea strudel into pieces as you desire. Serve with minted yoghurt and any remaining spinach leaves. Enjoy!